For immediate release: Alaska Software Inc. has made available for download the Release Candidate of Xbase++ 1.9 Service Level #1 to all recent Xbase++ as well as all active subscription customers. The Release Candidate comes as a German and an International (English) installation package. The Release Candidate can be downloaded via the download section in your individual customer area. To access the Service Level archive, please go to Login->MyAccount->Downloads->Community Previews. Merry Christmas and a Happy New Year from all of us at Alaska Software. During the Visual FoxPro Developer Conference 2008, which took place in November in Frankfurt, we got so much feedback and response from the FoxPro Community which we would like to express all participants our sincerest thanks for. Furthermore, we would like to extent our sincerest congratulations to the ten lucky ones of the VFP-DevCon-Participants! 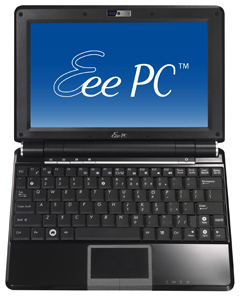 Eight of them will soon be able to call an ASUS Eee PC 900 XP their own. Alaska Software will donate the monetary equivalent to www.wikipedia.org , for the two ASUS which have not been claimed. Check out this picture of the little cute and lightweight ASUS Eee PC on the right!! A great number of our customers who have been actively and energetically involved in the improvement process of the Service Level 1, have already had the opportunity to familiarize themselves with the new features of the SL1. Hence today, we would like to provide all Xbase++ developers with an updated description of that feature-set list. 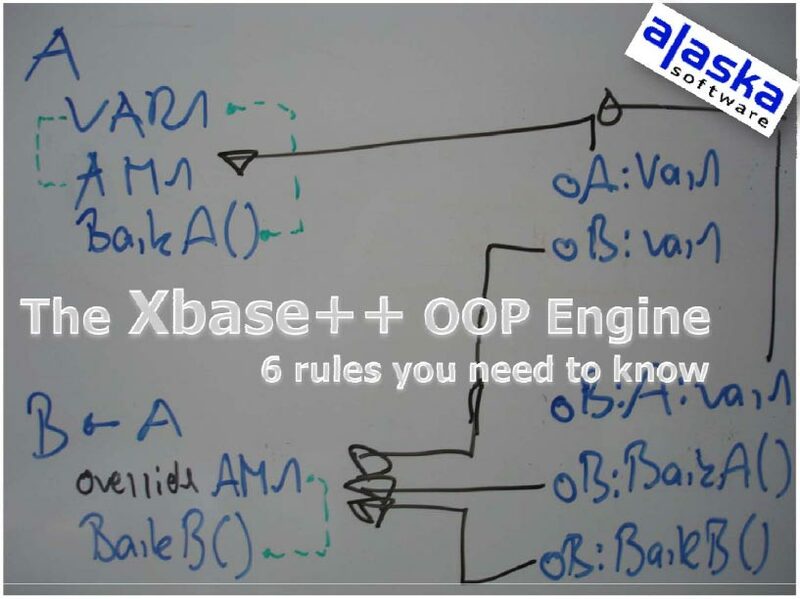 The Xbase++ OO Engine, 6 rules you need to know! Last but not least, if you wish to reap benefits from all these new technologies, you need to update your development environment to Service Level 1 after its release. Furthermore, this is going to be the prerequisite to participate and benefit from all future "Arctica" technologies. ... tackling all kinds of subject matters about programming with Xbase++. Check out the events-site every now and then, so that you will not miss the Xbase++ Event yearned for to assist. Of course, you are also welcome to step by at any Xbase++ UserGroup-Meeting taking place in your vicinity. The first eXpress++DevCon will commence on Sept. 15th, 2008 and last until Sept. 18th, 2008. It will take place in Boise, Idaho, USA - home to Mr. Roger Donnay and Donnay Software. Alaska Software will be present as well. Mr. Steffen F. Pirsig, CTO of Alaska Software has been invited as Special Guest Speaker, talking about the latest news from Alaska Software. In addition, Steffen F. Pirsig agreed to run a workshop regarding Object-Oriented Programming - depending on the audience this workshop will be at an Introductionary or Advanced level. This conference will focus entirely on showing how to improve your applications and become a more productive programmer. This gathering will give you an opportunity to get the answers to many questions you probably have had in your head for a long time and also show you many new things that will improve your end application. Most of the presentations will be given by Roger Donnay and other eXpress++ Professionals. There will also be given presentations from developers who have created successful applications and businesses using Xbase++and eXpress++. To find out more and to register, please click here . ... and time has come to zoom into the new feature-set enhancements of Xbase++ for Windows Vista, as starting July 1st 2008, only Windows Vista licenses are available from Microsoft!! Further sales of Windows XP have ceased on June 30th, 2008, and consequently are to be faded out. So hurry, don´t miss the boat!! Take a look at the most recent drop of the Community Preview of SL1 for Xbase++ 1.9, and enjoy features, like balloons, cues, etc. It is neat stuff, more details can be found here. In the aftermath of the PostgreSQL Conference in Ottawa, Canada, Alaska Software invites you to take a look at the talk held there. Familiarize yourself with the forthcoming PostgreSQL support of Xbase++. Check out the talk here. Anyone looking for a Client/Server solution in the context of Xbase++ and beyond should have a serious look into the PostgreSQL server. According to Alaska Software's CTO, Mr. Steffen F. Pirsig, the PostgreSQL preview is scheduled to commence after the ServiceLevel 1 for Xbase++ 1.9 will have been released. Check out the community -> events section regularly, as an array of Xbase++ related happenings and events get announced and posted there! Want to include your Xbase++-related meeting? - Just send us all relevant information by eMail . A first preview of the Service Level 1 for Xbase++ 1.90 has been released today. The preview is made available under the developer subscription program, and hence is accessible to all customers with an active subscription. In addition to general corrections and enhancements, the Service Level contains a number of changes related to the Windows Vista and Windows Server 2008 operating systems. Beginning with Service Level 1, both of these platforms are officially supported by the Xbase++ development platform. The Service Level preview may be downloaded via the download section in our customer area. Please go to Login->MyAccount->Downloads->Community Previews to access the Service Level archive. In the context of the PostgreSQL Conference in Ottawa , Canada, Alaska Software will hold a lecture concerning the forthcoming Xbase++ support of the PostgreSQL DBMS. The lecture is based on Xbase++ 1.9 and an early experience version of the new PostgreSQL technology. Active subscription customers shall be able to lay hands on that technology shortly after the PGCon 2008 conference. More details regarding the forthcoming PostgreSQL support in the context of the "Arctica" project can be found here. There is also a XUG meeting in Toronto , on May 25th, 2008. The meeting will be initially set up by Alaska Software and Boris Borzic, author of Xb2.NET and SQLExpress. The more people attend this meeting the more likely it is that this meeting will turn into another successfull regular XUG event! More details regarding the XUG Toronto can be found here. More information on the previously mentioned and other community events around Xbase++ can be found here. In accordance with our Product-Maintenance-Policy another series of Hotfix-Rollups for Xbase++ 1.90 have gone online. It consists of 8 Hotfix-Rollups covering around 40 PDRs. More details about each Hotfix-Rollup including download information can be found under Login->MyAccount->Downloads->Hotfix Rollups or here . Our application servers are going to be replaced by a couple of Quad-Core Xeon boxes. Hence, some of our online and web-application services may be disrupted over the easter weekend. Simultanously we would like to announce the rollout of a new web-application and inhouse solution infrastructure. All applications are developed using Xbase++ only: Web-applications are based upon the latest internal alpha build #402, rich client graphical user interface applications are deployed with the current validation level of Xbase++ 1.9 Service Level #1. All active Subscription customers can try out the Login feature on our homepage to setup their initial online account. As an immediate benefit, new Hotfix Rollups are available for download to all eligible users. Bear in mind, this rollout of these new solutions and technologies will be done in a step-by-step manner, accompanied by various technology previews available for active subscription customers. Should there be any disruption of our services we apologize upfront. As we all know, the numerous technical problems of the Vista platform have confronted many software and hardware vendors with an array of unexcpected issues. Now this may soon come to an end: On March 18th, 2008 the ServicePack #1 for Windows Vista has been "officially" made available. Alaska Software has been waiting for this step for months as many corrections and feature enhancements applied to the Xbase++ 1.9 platform are to be tested against Vista SP1. Unfortunately, testing in the past against various pre-release versions available has always led to different results, forcing us to continue awaiting the availability of Vista SP1 and Windows Server 2008. Actually both platforms Windows Vista and Windows Server 2008 introduced massive and fundamental changes in almost all technical areas of the operating system. Scenarios such as Single User-Desktop applications with and without the Aero user interface, network-based multi-user applications with and without Opportunistic Locking and the new SMB2 file/print sharing protocol had to be validated. In addition, careful testing and verification of Terminal Server and/or Remote Application-deployments were carried. Currently, final validation is on its way; after its completion a first wave of Hotfix-Rollups will be released to provide a dedicated update/resolution path for specific issues. After that a preview of the Service Level #1 for Xbase++ will be made available to our active Subscription customers. And shortly thereafter, the final version of the Service Level #1 for Xbase++ will be released. Alaska Software Inc. is very proud to announce that the 25,000th product-unit has been sold and shipped last week. Alaska Software would like to thank its customers for its loyality and perpetual support. Also, for those of you who are still not sure whether or not to go for the Xbase++ route, be invited to glance over an excerpt of the Customer and Reference List of Alaska Software. All these companies and institutions have trust in Xbase++doing reliably its job! So can you! !